May 1st was the 2nd Annual Illinois Marathon. Being that I was pregnant and puking last year, I only managed the 5K. This year, when Boston filled up before I had registered, I immediately set my sites on the Illinois Marathon, right here in Champaign-Urbana. In many ways, I was more excited for Illinois than I had been for Boston. After all, it would be the first time I would be able to sleep in my own bed at my own house the night before a marathon. Although I started running again 8 days after Will was born, training did not go smoothly. I had a newborn baby, for crying out loud. I defended, revised, and deposited my dissertation in the middle of all of this. There was snow and ice everywhere for the first couple months of training. And it was cold. I had injury after injury. Will started refusing to take a bottle, which made my long runs stressful. A fast time was never my goal for the marathon. I just wanted to cross the finish line in one piece. Based on the pace I was able to maintain during training runs, I thought maybe I could do it in about 5 hours. And I sincerely hoped Will would take a bottle that day. By the time the marathon rolled around, I was seriously burned out, and not just from taper madness. We have had a recent death in the family, and everything following that was (and continues to be) so, so awful. I wasn't sure if I would or even could still run the marathon after all of that. I finally decided to go ahead and do it because there was no real reason for me not to, but I just could have cared less about the marathon by this point. The night before the race, I was only able to sleep about 4 hours, and it wasn't because of Will. He sleeps pretty well for the most part now. I was just too worked up in grief and sadness (I'm in the anger stage now, which is actually better in many ways than just being sad about it) and couldn't get my mind to shut down. I felt like absolute and complete hell as Rob and I got ourselves up and around in the balmy pre-dawn of marathon day. In spite of the awful sadness in the week leading up to the marathon, I'd still been hungry and able to eat pretty well (I guess lactating and long-distance running will do that to you), but on the morning of the race, my stomach was completely uncooperative. Rob's parents arrived to babysit while I was in the middle of a crying jag in the bathroom. We had about a half an hour before we had to leave the house, and Will was still sleeping. I finally woke him up to nurse him before we left, and he was most unhappy with me. He was groggy and kept falling back asleep while I was trying to nurse him. Rob and I left the house and I felt completely unprepared to be running a marathon. I finally forced down a Clif Bar but felt for all the world like it would come back up again. I had grabbed a banana before we left the house, but I couldn't make myself eat it. I carried it around for a long time, thinking my stomach would feel better, but it didn't. I ended up running with the banana for the first 3 miles of the race and then ditching it along the side of the road. What I wished I'd brought with me was some water. I was really thirsty before the race began, which even in my hellish state I knew was a bad sign. By 7am, it was hot (how hot I don't know.... I was warm standing outside in just shorts and tank top) and ridiculously humid. I wished Rob good luck and went to the start line, positioning myself around the 4:30 pace group and wondering if that was a huge mistake (i.e., was it too fast for me?). I stood there and waited forever. I wished that I wasn't so boxed in and could have found my friend Aimee who was running the half. I had lined up near where I thought she would be, hoping we could run together before the half marathon and full split off. But with 13,000 other runners out there, I never did find her. Finally without any warning, we were off. Rob (who was at the front of the pack) said they actually said "go" or something like that, but way back in 4:30-land I heard nothing other than the conversation of the two girls next to me who were doing the half and both had worn make up and were wondering if their mascara would run (to their credit, I'm sure they were really nice, I was just in no mood). Anyway, at first I wasn't sure if the race had actually started, because we were just sort of meandering forward in a slow walk, then stopping for several seconds, then meandering forward again, but eventually we reached the start line and could pick it up to a slow jog. It was really crowded at first, and I had a lot of trouble getting into my own pace. In addition, I was very thirsty. I thought, surely there will be a water stop soon. I was running near the right side of the road and saw a hash mark with a number 1 in a circle, and I thought... was that really the Mile 1 marker? No other marking? I wouldn't have even seen it if I'd been in the center of the street. Surely there would be water soon. My mouth felt like there was cotton in it. Along Green Street, there was an area littered with used, empty paper cups-- remnants of some water station. Had there been a water station there for the 5K, and did they remove it for the marathon? Why on earth would they have done that? Still running, still thirsty and still no water. Out of campus town now. A family had set up a small card table with a pitcher of water and some paper cups outside their house. I momentarily paused, thinking it was an official water stop, but then realized it was too small. Dozens of other runners had stopped there though. I went on past, thinking there was too little water for all those people and sure that there must be an actual water stop up ahead. I was momentarily distracted by a little boy who had come outside of his house and was playing the clarinet. Cute. Finally I could see a water stop approaching. We had to be almost to the 3 mile mark now. And volunteers were handing out... empty paper cups. "Sorry, we're out of water," they were saying. "You've got to be kidding," I mumbled through parched lips. Just up ahead there were more volunteers, pouring water into our paper cups from a pitcher. I wondered how a single pitcher of water was going to fill the paper cups of hundreds of runners around me and how I would ever manage to get any. I had to wait in a jumbled line of thirsty runners, but eventually got a half a cup full of luke-warm water. The next couple of water stops were the same... out of water, waiting in line to get a small amount. I was actually getting really panicky. The temperature was supposed to be in the high 70's by the end of the race, and I had been thirsty before it had even begun. I realized, this must be what it's like in the back of the pack. I sincerely hoped that Rob had avoided these problems, way out in front. He has a lot of trouble in the heat, and I knew he really, really needed to stay hydrated. After the first 3 water stops, I never had another problem throughout the rest of the race. And the miles were marked really well after that too. By about Mile 7, they had gatorade as well, and at each station I took a full cup of water and a full cup of gatorade. I ended up staying really well hydrated, probably better than any other marathon I've done. At Mile 8 we entered Meadowbrook Park, a location where I have run hundreds upon hundreds of miles in my life. It got really congested again. We'd gone from having the width of the street to run on to the width of a sidewalk. It was a little ridiculous. I'd been running 9:45 to 10-minute miles, but my first mile in the park was 10:30. After that I ran on the grass bordering the sidewalk, so as to not be way-layed by runners even slower than myself. Seriously, if they include Meadowbrook again next year, I think it would be better to do it after the half and full marathon runners split off from each other. Way out front where Rob was, he said he didn't have a problem, so I guess it was more of an issue for us in the back of the pack. Near Mile 11, I got to see Will, which was by far the highlight of the marathon. He was out in his stroller with Rob's parents to watch the race. I stopped long enough to kiss him and make sure he was okay, and then was on my way. Seeing him bolstered me enough to run faster for the next several miles and ignore the fact that we had left the tree-lined shady streets of Urbana and were running in the direct sun. Despite the heat and sun, I felt great (actually a lot better than I had at the beginning of the race). At some point in there I caught up with and then passed the 4:20 pace group, and I wondered if I could hang on. By Mile 18, I was starting to feel a little tired. Around Mile 19, we entered the one part of the course I had not run on before. I was still okay, but feeling just the slightest indication that I was beginning to enter the crazy zone. I had my cell phone with me and thought, hmmm, maybe I'll call my mom just to say hi. So I did. My mom thought it was a riot that I had called her while I was running the marathon. Pretty soon I was passing Mile 20 and then 21 and still had not gone over the edge into the crazies. My mom went to her computer and pulled up a map of the course so she could follow along. I'd only meant to say hi, but by the time I was at Mile 23, my mom said we might as well keep talking until I crossed the finish line. She thought that would be cool to hear all the cheering as I ran through the stadium where the race ended. The course was fairly sparse by that time, but the other runners around me must have thought I was talking to myself and was crazy. I didn't really care though. I knew it was probably using up energy to talk (even though my mom was mainly talking/cheering for me and I was just listening), but for some reason I felt like that was what I needed to get to the end. In retrospect, I feel really bad for keeping my mom on the phone with me for the last 7 miles of the marathon because I'm sure she had other things to do. It really helped get me to the end though. I never felt bad; I never had any of those ugly terrifying miles when you just want to lay down on the side of the road and cry. Somewhere towards the end, my friend Cara called me too. It was awesome, like having my very own cheering section. Miles 22 through 24 dragged on a bit, but I managed to keep it around 10:00 pace. I knew I would make it. It wasn't pretty, but the faster I ran, the faster I would be able to get back to Will. Once we finally turned onto Armory Street, I knew I was home-free. I have run this part of the course hundreds of times and felt like I was on my own turf. We turned onto Hessel Blvd and I cruised to the end. 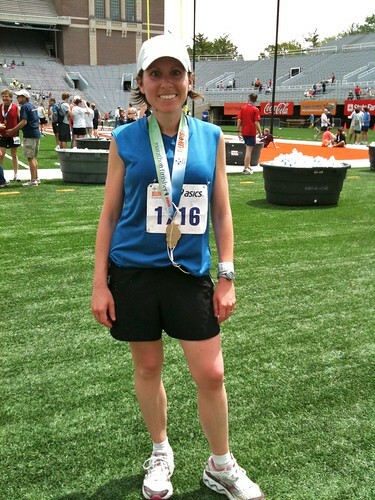 Before I knew it, I was entering Memorial Stadium and running across the astroturf to the finish line. I had made it! My finish time was 4:16:10, which was almost an hour faster than I had thought I might be able to run. I guess the key to being happy with your marathon time is to set your expectations low. I found Rob and his dad in the stadium and we regrouped to head home. I really just wanted to get out of there and get back to Will. We'd left around 6:30 in the morning to head over to the start line, and it was now after noon. That was the longest I'd ever been away from him. And considering that he hadn't nursed very well before we left, I was in a lot of pain and practically shooting out milk. I had to get home and feed that baby! When we got back home, I found that my worst fear regarding Will and this marathon had come true. He had pretty much refused to eat anything, either baby food or milk, while I was gone. He nursed most of the afternoon and evening, which was fine by me because I needed to get rid of all that milk, and also I just got to sit there and hold him, which was what I wanted to do more than anything in the world. I'm glad I ran the Illinois Marathon this year. It was my 9th marathon, and my first one back since having Will 8-1/2 months ago. I figured this would be my slowest marathon yet, but my finishing time was actually about 2 minutes faster than my first marathon, some 7 years ago. It was one of the smoothest marathons I've ever run--the volunteers were great, and I had my mom and Cara talking to me on the phone during the final miles. Plus, after having given birth, everything else feels kind of pale in comparison. Anyway, everything is just kind of rough because of the awful sadness that is going on in my family right now. Running a marathon just seemed inconsequential. There are bigger things to focus on. Please continue to keep my sister and her husband (and my mom, who is the glue who holds us all together) in your thoughts right now.